Yossi Milo Gallery is pleased to announce a solo exhibition of new paintings by Doron Langberg in Fall 2019. This is Langberg’s debut exhibition at Yossi Milo Gallery. Langberg’s large-scale portraits on canvas render friends, lovers, and family members with a focus on love and desire as fundamental human experiences. In his work, Queerness functions as a lens through which Langberg views the world around him, capturing different moments ranging from the mundane to the deeply intimate. Sourcing his imagery from observational paintings and drawings, Langberg builds his pictures through a versatile vocabulary of material gestures. Large brushstrokes, stains, vigorous erasures, thick applications of paint, washes of chromatic color, as well as passages of exacting description bring his figures to life. Often inhabiting moments of repose or contemplation, his subjects fade against the textured surfaces of their environments, while asserting an uncanny presence. 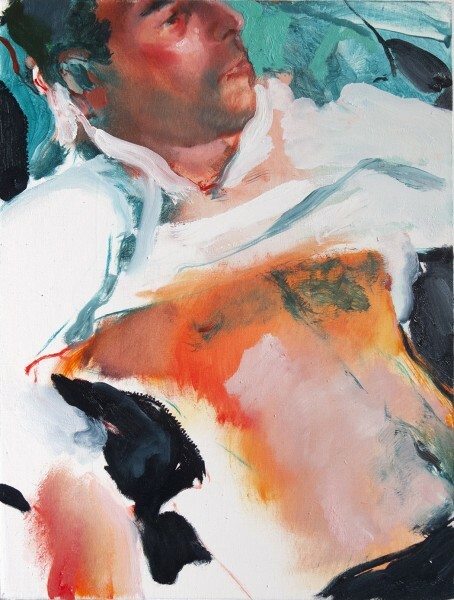 By foregrounding color and materiality in his handling of paint, Langberg elicits bodily sensations like ecstasy, physical warmth, or heaviness of breath, striving to humanize queer pleasure, intimacy and friendship. Langberg received his MFA from Yale University after earning his BFA from the University of Pennsylvania and the Pennsylvania Academy of the Fine Arts, Philadelphia. His paintings will be on view at the American Academy of Arts and Letters in New York City in Invitational Exhibition of Visual Arts from March 5 – April 7, 2019. Recent exhibitions include Zig Zag Zig, DC Moore Gallery, New York (group); Intimacy, Yossi Milo Gallery, New York (group); Nothing Personal, 1969 Gallery, New York (solo); Intimacies, George Segal Gallery, Montclair University (group); Gaby Collins-Fernandez and Doron Langberg, Danese/Corey, New York (two-person); Moments of Intimacy: Kyle Coniglio, Anthony Cudahy, Doron Langberg, 68Projects, Berlin, Germany (group); When We Become Us, Capsule, Shanghai, China (group); Queering Space, Green Gallery at Yale University, New Haven, CT (group); and Nighttime in New York, Galerie Thomas Fuchs, Stuttgart, Germany (group), among others. Langberg was born in 1985 in Yokneam Moshava, Israel. He currently lives and works in New York City.